From the standpoint of aerodynamics, there aren’t many ways to make a modern airplane a lot better in a single bound, but as computers gain power smart designers can eke out subtle gains and combine them to extract more performance, which is what the engineering team at Daher-Socata has done with the already successful TBM single-engine turboprop line. In the case of the newest edition–the TBM 900–the team did the redesign without a hint to the aviation world, revealing the result only when it was ready to accept orders from eager buyers for nearly immediate delivery of a certified airplane. The TBM 900 program, launched more than three years ago, culminated in not only the announcement of the new model on March 12 but also the news that the upgrades it introduced were already approved. More than 160,000 hours of research and development and 200 flight-test hours went into the TBM 900 program. The results are more performance, comfort and utility, derived from aerodynamic changes to the nose and cowling airflow, landing-gear doors, wings and empennage, a new Hartzell propeller with five dramatically shaped composite blades, a simplified single-lever power control, systems upgrades and improvements in the cabin. Performance is everything, however. While buyers have welcomed all the improvements, the new TBM climbs more quickly, flies faster and moves the aircraft further into the light-jet performance arena. The main difference between the TBM 900 and light jets is the number of engines and maximum altitude. Otherwise, in many respects–price, fuel efficiency and payload–the TBM outperforms many of its competitors. TBM distributor Columbia Aircraft Sales, based in Groton, Conn., made a new TBM 900 available for AIN to fly in mid-May. Columbia Aircraft Sales is part of Columbia Air Services, itself a member of the Columbia Aviation Companies network of aircraft sales, maintenance and FBO providers. The company’s Groton-New London Airport Columbia Aircraft Sales facility is a Daher-Socata TBM and Piper distributor for the Northeast U.S. (and TBM in eastern Canada). The Air Services side of the business at Groton is a TBM, Piaggio and Piper authorized service center and has extensive experience maintaining the Pratt & Whitney Canada PT6 that powers the TBM, Avanti and Meridian. Although a gusty wind churned the air down low, demo pilot and TBM sales manager Ken Dono and I lucked out otherwise and were able to put the speedy single through its paces without having to deal with weather. We were able to climb directly to FL280, followed by a descent to below FL180, where we did some airwork. We did only one landing at Groton because the airport’s main runway (5/23) was closed for repairs, and the strong wind was blowing directly across Runway 15/33. Daher-Socata kept the TBM 900 under such a tight lid that even Dono, a highly experienced TBM pilot who has sold many TBMs, wasn’t told about it until January, during a visit to the TBM factory in Tarbes, France. The differences between the TBM 850 and 900 aren’t hard to spot, and the most apparent are the five-blade Hartzell composite propeller, which replaces a four-blade all-metal Hartzell (some 850s have been modified with a five-blade wood-core MT propeller) and the new two-foot-high winglets, also composite. While the cowl doesn’t look much different on the 900, it is now made of composites and features a slightly twisted, banana-shaped air-intake plenum and new exhaust stacks said to improve intake and exhaust flow efficiency greatly. More subtle is the new composite dorsal fin, which blends the fuselage to the vertical fin more smoothly than the sharply angled transition on the TBM 850. Even more subtle is a six-inch strake mounted on the left lower forward fuselage about two feet in front of the wing leading edge. The strake helps prevent what was a common characteristic of the TBM series, a slight drop of the left wing during a stall caused by vortices that flow over the left wing root, according to Dono. The strake’s position was decided initially in the lab and then refined in flight-testing during more than 2,200 stall tests. A sharp-eyed TBM fan might also notice the inner door covering almost 90 percent of the landing-gear leg, which reduces drag as much as would a door covering the entire landing gear. All of these changes were made with computational fluid dynamics (CFD) tools that didn’t exist when the TBM 700 was designed in the mid-1980s. The new dorsal fin and a new torque limiter on the PT6A allow takeoffs at the engine’s fully flat-rated 850 shp instead of the 700 shp limitation in the earlier TBMs. All of these improvements and the five-blade Hartzell propeller reduce standard-day sea-level takeoff distance by more than 20 percent, improve climb rates (18 minutes to the 31,000-foot certified ceiling) and boost range to 1,730 nm (with 45-minute reserve). All external lights are now LEDs, but that isn’t the only change to the electrical system. A new 300-amp starter-generator accelerates the start sequence, and the starter now switches off automatically at 50 percent Ng. This feature is a benefit of the new consolidated electronic power system (EPS) designed by Astronics. Located on the ceiling of the unpressurized forward baggage compartment, the EPS in one unit provides control of the starter-generator, backup generator and primary power bus. “It combines the functions of at least three separate boxes and is smaller, lighter and costs less,” said Christine Ellis, director of new business development for Astronics Advanced Electronic Systems. “Those were some of the driving factors for its development.” EPS makes management of the electrical system much simpler for the pilot and it lowers maintenance costs. For example, if the starter-generator fails, the EPS automatically reconfigures itself to use the backup generator, and if that fails it taps the main ship battery. Climbing into the cockpit–this airplane had the Elite package, which includes the optional pilot door–reveals more improvements: a redesigned landing-gear control panel, slimmer curved console between the seats and an uptilted subpanel, including the Garmin GCU 475 FMS control panel, to make more room for the pilot’s legs. Dono said that it was easy for legs to hit the throttle in the earlier TBMs. The yokes are new and include seven switches instead of four. In addition to the TBM 850’s rudder and elevator trim, control-wheel steering and autopilot/trim disconnect switches, the new yokes add transponder ident, frequency change on Com 1, timer control and Stormscope clear buttons. The center of each yoke is designed to accommodate an iPad simply, and to power portable devices the panel is equipped with two USB ports and a 12-volt charger socket. Adjustable rudder pedals and three-axis adjustable seats simplify the process of fitting the airplane to the pilot. The biggest change that TBM 850/700 pilots will notice is the single-lever power control, which replaces the throttle and propeller controls and the condition lever. “It takes about five minutes to get used to,” Dono said. While it might look complicated at first, the only time pilots have to worry about what to do with the throttle is during the start sequence and when shutting down the engine. Otherwise, it’s simple and allows the pilot to pay more attention to flying. “It’s a lot easier than it looks,” he said. The throttle, as Daher-Socata calls the power control, operates in what looks like a manual gear-shift lever pattern, an “h” where the left side is the thrust mode for taxi and flight and the right side is condition mode for start and cutoff. In condition mode, including during engine start, the propeller is always feathered. Most of the TBM 900’s systems are the same as the 850’s, except that the pressurization system is now fully automatic, something that is becoming common in airplanes equipped with Garmin G1000 through G5000 flight decks. As on earlier TBMs, the fuel system remains extremely simple to operate because it automatically cycles the fuel selector between each wing every five minutes. It’s a little strange to see the fuel selector moving on its own at the rear end of the console, but there is an important reason that the selector handle remains connected mechanically and follows the automatic movement of the selector valve. If the automatic sequencer system were to fail, the pilot can still manipulate the fuel selector, Dono pointed out. Daher-Socata switched the TBM 850 to the Garmin G1000 flight deck in 2008, and a key difference between G1000 installations in smaller aircraft is the GCU 475 remote FMS control panel (which is also on Cessna’s Mustang very light jet). The Garmin system, with a huge 15-inch multifunction display (MFD) in the center flanked by two 10-inch primary flight displays (PFDs), fits perfectly in the TBM, nearly filling the entire panel but leaving room above the pilot’s PFD for an L-3 Trilogy ESI-2000 backup instrument with integral backup battery. Now that Garmin cockpits with touchscreen controllers are growing increasingly popular in airplanes ranging from the Cessna TTx piston single to the new Citation X+, I couldn’t help wondering why Daher-Socata elected to stick with the GCU 475 and it’s alphanumerically ordered keyboard. Garmin wouldn’t provide any information about the cost of the GCU compared to the touchscreen controller, but even if the costs are similar, the cost and time needed for certifying the touchscreen controller in the TBM 900 would have been prohibitive and would have made it too expensive to add all the other improvements. The GCU works fine, but the touchscreen controller is far easier to use, and hopefully a switch to the more modern system is on Daher-Socata’s drawing boards or cad/cam screens. The easy engine start requires just a short push and hold of the starter button then watching for at least 13 percent Ng and ITT below 150 degrees C, both occurring before 20 seconds, then moving the throttle (in the condition mode) from cutoff to low idle. Once all parameters are in the green and the engine reaches 52 percent Ng, then the throttle is moved into the flight idle position on the thrust mode side of the “h” gate. From this position, it took little throttle to get the TBM 900 moving at our weight of 7,090 pounds, but once moving I had to pull back the throttle into beta occasionally to moderate our taxi speed. We were carrying full fuel, 291 gallons/1,950 pounds, and were about 300 pounds under the 7,394-pound maximum takeoff weight. Once lined up on Groton’s 4,000-foot Runway 15, I advanced the throttle to about 50-percent torque before releasing the brakes, then brought the power to 100 percent as we accelerated then rotated at just under 90 knots to a 10-degree nose-up attitude a little more than halfway along the runway. We accelerated quickly to about five knots faster than the recommended 124-knot initial climb speed, which initially gave us more than 2,000 fpm in the climb. Once cleared to go higher, we climbed at the recommended 170 ktas, still clocking more than 2,000 fpm through 15,000 feet. At 20,000 feet, the TBM 900 was climbing at nearly 1,700 fpm. Before we began to level off at FL280, the climb rate was still better than 1,500 fpm, and it took us fewer than 17 minutes for the climb to FL280. Conditions at FL280 were ISA +11 degrees C, and after a few minutes I pushed the torque up to 92 percent for maximum cruise, which shot us along at 323 ktas burning 61 gph, about five knots faster than the AFM number. At this altitude I could throttle back and fly at 246 ktas burning less than 40 gph and stay aloft for another six hours for a no-wind range of 1,500 nm. With power set to maximum cruise, four hours would take us 1,200 nm. 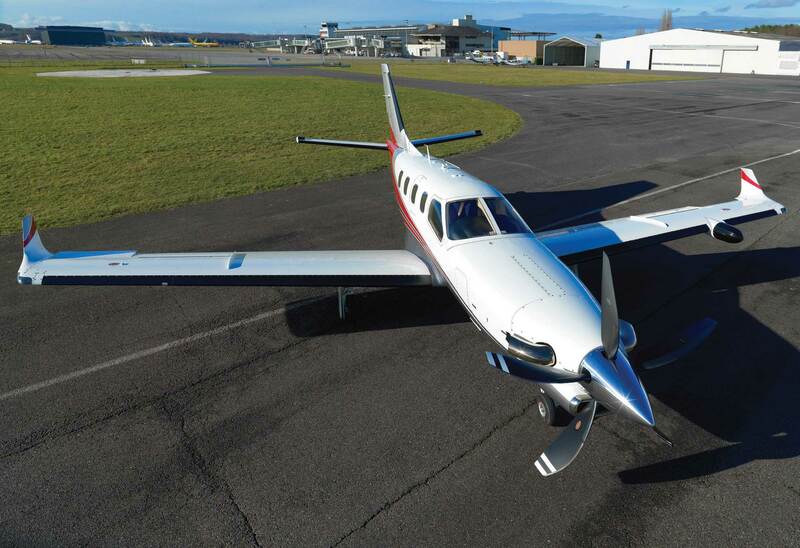 With a full-fuel payload of 891 pounds, the TBM 900 is enormously flexible, and especially so because the typical business flight rarely carries enough people to fill all six seats. “It’s a get-there machine,” said Dono. After flying north toward Worcester, Mass., we swung east over Boston then began descending as we headed toward Rhode Island. We didn’t try a rapid descent, but Dono said the TBM can descend at 8,000 to 10,000 fpm at Vmo if necessary. “It’s built like a tank,” he said. We settled for a more sedate 4,000 fpm down to 16,000 feet. The PT6 burns about 10 more gph at that altitude, moving along at a more sedate 286 ktas. I did some steep turns at 8,500 feet, and they were made much easier by laying the G1000’s handy flight-path marker onto the horizon line. The TBM needs a decent amount of trim to stay level in the turn without having to haul on the yoke, but it was solid and comfortable all the way around, with crisp entries and exits that made maneuvering a pleasure. As we slowed to prepare for a stall, the TBM’s spoilers and improved aileron authority (attributable to the winglets) made slow-flying handling solid and precise. The nose pitches up with extension of the flaps, but Dono had warned me about it and I was ready to trim it out. I held the nose into a wings-level gear- and flaps-extended stall for a few seconds and there was no strong stall break, just a gentle mushing. The TBM descended about 200 feet during the recovery, which was easily accomplished by adding power and unloading the wing with a little forward yoke. The nose didn’t drop to the left at all. The gusty 90-degree, 15-knot crosswind at Groton bounced the TBM around a bit during final approach, but keeping the nose pointed straight down the runway was not a problem. Over the fence at about 90 knots, the TBM landed about a third of the way down the runway, and a touch of reverse had us plenty slow enough to take the second taxiway back to the Columbia Air Services ramp. Viewing this report requires Adobe Reader be installed on your device. If it's not currently installed, click here to download.